The kinetic jihad is most effective when the target community is softened up before violence is brought upon them and then driven into the arms of the suit-wearing jihadis after an attack. 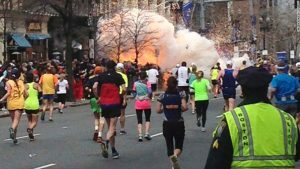 On April 15, 2013 two muslims, Dzhokhar and Tamerlan Tsarnaev, remotely-detonated two bombs they placed at the finish line of the Boston Marathon. Three people were killed, including an eight year old boy, and 260 people were wounded including 16 who lost limbs as a result of the attack. Three days later, MIT police officer Sean Collier was assassinated by the Tsarnaev’s while on duty in his vehicle on campus. Later that night, the Tsarnaevs carjacked a vehicle and kidnapped the driver. The driver escaped and helped police track the car to Watertown, Massachusetts where an extensive firefight took place in the early morning hours (12:30 AM) of April 19th between police and the Tsarnaevs. During the assault, the Tsarnaevs used homemade grenades against the police. Tamerlan was killed after he was shot and run over with the vehicle his brother was driving to escape. Later in the day on the 19th, Dzhokhar was discovered hiding in a boat in a yard in Watertown. 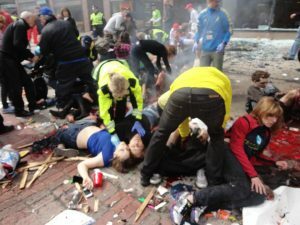 After a confrontation, Dzhokhar was shot and then taken into custody. He was found guilty and sentenced to death. During this episode, Massachusetts Governor Deval Patrick literally shut much of the Boston area down during the manhunt for Dzhokhar Tsarnaev and, from all accounts, he and Boston Mayor Thomas Menino earnestly wanted him caught. Yet, these are the same men – Patrick and Menino – who, prior to the bombing, defended and publicly lauded leaders in the Islamic community who called for this type of behavior (jihad), and who represent known jihadi/Muslim Brotherhood organizations. One clear example: The Islamic Society of Boston’s (ISB) Cultural Center, also known as the Roxbury Mosque, officially opened in 2009. The ISB was founded by convicted and imprisoned Al Qaeda financier Abdurahman Alamoudi, and had as a founding trustee Yusuf al Qaradawi, the International Muslim Brotherhood’s most revered Islamic scholar and jurist. Currently, renowned Muslim Brotherhood leader Jamal Badawi is a trustee of the ISB. Badawi is listed on Muslim Brotherhood documents, declassified FBI documents, and other evidence as a senior Muslim Brotherhood leader who has served in leadership positions in numerous Brotherhood organizations, including as President of the Islamic Society of North America (ISNA). A seven minute video, available HERE, was produced by the Americans for Peace and Tolerance detailing the links between the ISB’s Cultural Center and the support given by the Governor and the Mayor to one prominent Islamic/Jihadi leader, Imam Abdullah Faarooq. This video is an excellent tutorial in how leaders like Governor Patrick and Mayor Menino collaborate with jihadis, wittingly or unwittingly, to make communities like Boston significantly more dangerous for its citizens. Money to build the ISB’s Cultural Center came from Saudi Arabia, but support also came from the Boston Mayor’s Offfice when Mayor Menino sold the land to the Center – valued at over $2 million – for only $175,000. 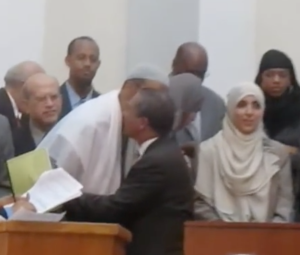 Governor Patrick had a close relationship with several jihadi leaders in the Boston area, but none more noticable than Imam Faarooq, whom he publicly hugs in the video. Yet, after the Boston Marathon bombing, suit-wearing jihadis conned Massachusetts officials to draw even closer so muslim leaders can work more closely to them. The muslims objective, to continue to control the narrative. “Islam is peace, and if you don’t regurgitate that we will blow up your city.” Using the violent jihadis to push U.S. officials and leaders into the arms of suit-wearing jihadis. Oddly, the Islamic leaders have yet to share the truth with their local/state/federal “friends” that jihad is an obligation for all muslims until the entire world is under sharia (Islamic Law). And so the cycle goes. The Muslim Brotherhood organizations across the United States have been the “birthplace” of jihadis in Chattanooga, Little Rock, Seattle, Ft Hood, Denver, BOSTON, and so many others, yet they are still operating. And why do they do this? Because this is what Islam is and this is what Islam requires. This war will be won – or lost – at the local level. Citizens must know the enemy and know who we are as Americans. Know our founding principles and defend them. The people of Boston have historically been strong and closely knitted together, especially in times of trouble. Now they must come together to identify and crush the enemy in their midst. Citizens in many towns around the nation need to do the same. Yet, sadly, we are losing this war that most Americans do not even know we are fighting. Is that Linda Sasour standing near Obama? If it is,I wouldn’t be surprised….. fancy that….another “community organizer”…. Can anyone tell me why we are allowing muzslime to exist among us. Is there so much ignorance, or is it just some inevitable plan. It is totally insane behavior, to embrace those who at CLEARLY dedicated to our death and destruction. What is feeding the utter stupidity?